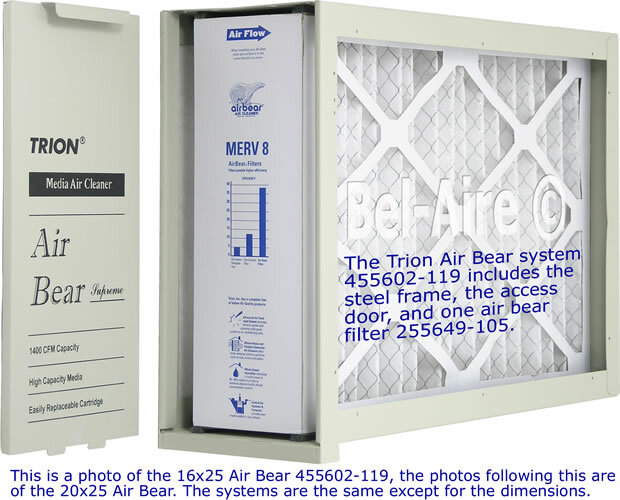 Trion Air Bear 16 x 25" 1400 CFM media air cleaner. Textured power coat finish on 20 gauge steel. Includes the steel cabinet, access door, and one air bear Merv 8 filter 255649-105. 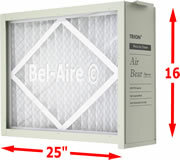 Featuring the five inch thick Air Bear media filter, providing high-performance, low resistance and high-dirt holding capacity. The Air Bear conquers airborne particles for a cleaner, healthier home environment. Radial Pleating and Omni-directional fiber design, allows maximum dust holding capacity while not obstructing air flow. Trion whole-house media air cleaners can be easily installed and are suitable for use with all types of central forced-air heating and cooling system configurations. Since 1947 Trion has been a leader in air purification. A division of Fedders.